In a blender or food processor combine the mayonnaise, 1 cup of the spinach, the garlic salt, and pepper. Set aside. Brush one side of each slice of bread with the olive oil; place, oiled side down, on waxed paper. 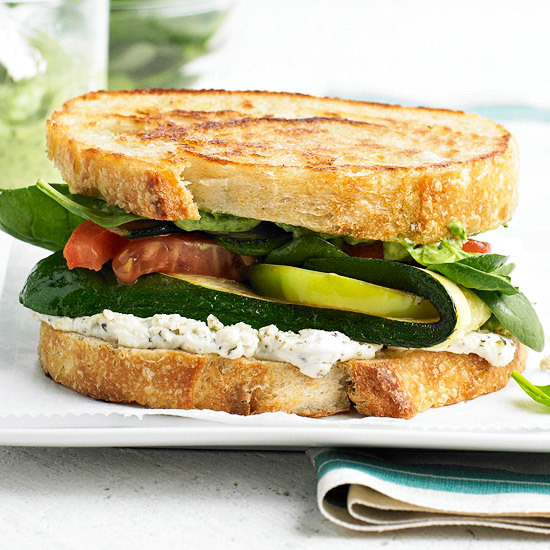 Spread goat cheese on half of the slices; layer zucchini, tomato, and remaining spinach on top. Spread some of the spinach mayonnaise on remaining slices; place bread on top of vegetables, spread side down. Cook sandwiches in a very large skillet over medium-high heat for 6 to 8 minutes or until bread is golden brown, turning once, Pass any remaining spinach mayonnaise.